In North Dakota and Minnesota, ideal planting time is in mid- to late-April so that plants can close rows by June 21 to maximize photosynthetic activity during long daylight hours for highest yields. The lack of snow and rainfall preceding and during early April resulted in growers being able to plant over 90% of their sugarbeet crop during April. However, inadequate soil moisture in many areas resulted in delayed emergence, and in some fields, uneven seedling emergence. Fortunately, several rainfall events in May and June have resulted in adequate moisture for the sugarbeet crop as well as recharging of the soil moisture content. May was relatively cool but since June 1, average daily bare soil temperature was over 55°F resulting in rapid crop growth. As such, most fields in Minnesota had a full canopy by the 4th of July. Most fields had slow but good emergence resulting in 150 to 200 plants per 100 ft. of row. In some areas, based on moisture availability, seedlings emerged at two or three separate times. 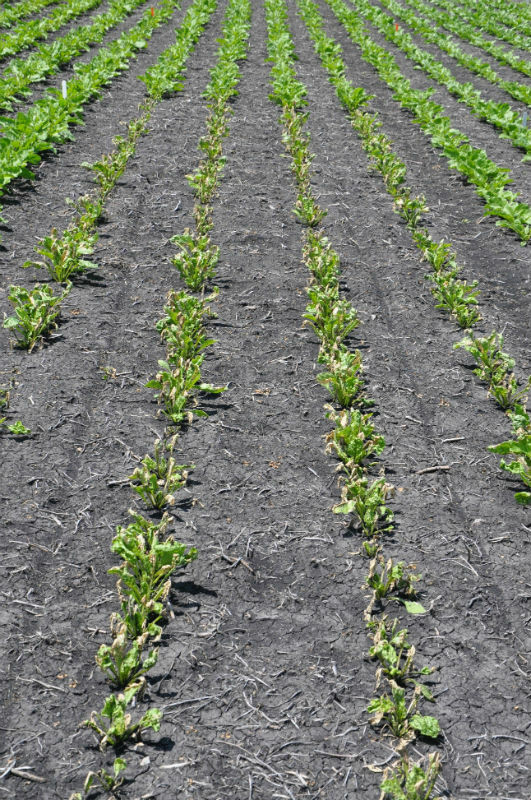 In about 2 to 3% of total acreage planted, a combination of inadequate moisture and/or untimely moisture, frost, and heavy winds resulted in poor and non-uniform emergence. Figure 1. Severe burning of four inner rows of sugarbeet sprayed with a Quadris fungicide and herbicide mixture containing MSO. Growers have done a good job of managing weeds. There are several options for effective and economical weed control. 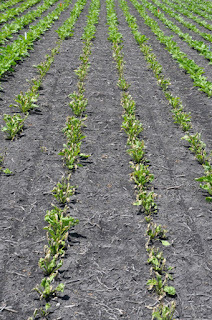 It is always best to start with a clean seed bed, use pre-emergent herbicides, start herbicide application when weeds are small, use lay-by herbicides, use recommended rates of herbicides and apply at the appropriate time of the day, and use manual labor and mechanical cultivation when necessary to remove difficult to control weeds. Consult your agriculturists for best management practices for weed control in your factory district. One option to reduce production costs and the number of passes made over a field is to mix herbicides with fungicides and sometimes insecticides. Please check with your agriculturists to ensure that these mixtures are compatible. Be particularly careful when adding adjuvants to herbicide mixtures containing Quadris fungicide. The use of methylated seed oils (MSO) in some herbicide mixtures containing Quadris can cause severe phytotoxicity to sugarbeet plants (Figure 1). Many sugarbeet production areas have had significant rainfall during the past several weeks. Improve surface drainage where possible and avoid field work in wet fields since this may lead to compaction or damage to beets in rows. In fields that are wet but need a pesticide application at this time, think about using an aerial applicator to avoid using ground rigs. At this time fields would have had or will soon have its final application for weed control. Scout fields for insects, weeds and diseases such as Aphanomyces, Rhizoctonia and Fusarium when conditions allow. Infected plants should be sent to University of Minnesota Research and Outreach Center at Crookston or NDSU Diagnostic Laboratory to confirm which pathogen or pathogens are present in specific fields. Strategies should be developed to manage these soil borne diseases when sugarbeet is planted again in the current infected fields.